In the world of multi-purpose greases, AirTec MoS2 is the heavy hitter. It is made with a medium weight base oil for extra durability while the 3% moly additive will take the high pressures and extreme punishment found in the heaviest of construction equipment. If you are running heavy construction equipment this is the grease you want, especially in the pins and bushings! 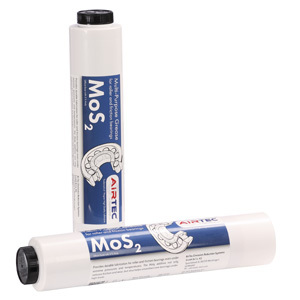 AirTec MoS2 is a lithium based, multi-purpose grease containing 3% molybdenum disulfide, which gives it excellent wear and pressure protection. This is grease is best used in the high-stress friction bearings found in suspensions, heavy construction equipment, and industrial machines. In addition to the 3% moly, it also contains corrosion inhibitors, polymers for better metal adhesion, and anti-oxidant additives that make it a great all-around grease for high temperature and high-pressure situations.